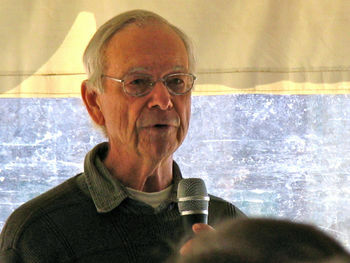 Allan Savory (born 15 September 1935) is a Zimbabwean biologist, farmer, soldier, exile, environmentalist, and winner of the 2003 Banksia International Awardand the 2010 Buckminster Fuller Challenge. He is the originator of holistic management. Savory has said, "only livestock can save us." Through reversing desertification, he believes rangeland soil has the ability to sequester vast amounts of CO2. In the 1960s Savory was working on solutions to the problems of increasing poverty and disappearing wildlife. He slowly began to develop an understanding of the relationship to animals and their value on grassland ecosystems. He also admits to making many mistakes in his management practices including culling large number of large herbivores. He continued working with game managers as a consultant through the 1980s. He began to notice a pattern in the herds of animals that they return to areas of grazed land after 3 days. Savory was a Member of Parliament in Zimbabwe during its civil war. He served as a leader of the opposition to the ruling party which was headed by Ian Smith. As a result he was went into self imposed exiled in 1979 and emigrated to the United States. This move could is a prime example of walking to freedom. Savory and his wife now divide their time between Zimbabwe and New Mexico. After moving to America he co-founded the non-profit organization Holistic Management International with his wife, Jody Butterfield. This non-profit is focused on education in the processes of managing holistically. In 1992 they formed a second non-profit called The Africa Centre for Holistic Management focused on education of local populations in southern Africa. The Savory Institute promotes large-scale restoration of the world's grasslands through holistic management. TED video: "Allan Savory: How to fight desertification and reverse climate change"
This page was last modified on 21 August 2014, at 02:51.